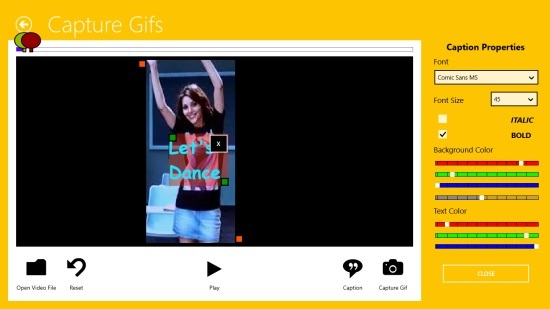 VidGiffy is a free Windows 8 animated GIF creator app that lets you create GIF animations from a video file. Using this app, you can convert part of a video into an animated GIF and share it. This free Windows 8 animated GIF creator app works on the principle of animated GIF. It lets you extract a series of frames in succession from a video file and save it in the special GIF (image) file format. Since the app is integrated with Windows 8 Share charm, you can also share these animated GIFs via e-mail. VidGiffy supports almost all common video file formats. You can create beautiful animated GIFs and have fun. To make it even more interesting, the app offers the option to add captions to the animated GIFs. You can also select a smaller region or a specific region of a video and convert it into GIF. A guide video is available on the app’s main page which will help you understand how the app works. VidGiffy is freely available in Photo category of Windows Store. You can also view it directly in Windows Store by clicking the link given at the end. Since VidGiffy is a lightweight app (around 1.3 MB), it will just take a few seconds to download and install this app on your Windows 8 system. Once you install and launch this app, you will see app’s Start screen with three options: Capture Gifs, Recent Gifs, and Guide. To create an animated GIF from a video file, click on the option Capture Gifs. You will see a big screen with a few options below it. These options are Open Video File, Reset, Play, Caption and Capture Gifs. On right side of this screen, Gif Properties will be displayed including Number of Frames, Resolution, Scale Factor, and Color Fidelity. Scale Factor and Color Fidelity let you choose the resolution of the animated Gif, thereby reducing its size. Below Gif Properties, a screen icon will also be displayed. Click on Open Video File to browse and open a video out of which you want to create animated GIF. Choose the desired animation interval by dragging two balloon pointers on the scroll bar, placed above the video screen. Click on Play to watch the selected animation interval. While the video is being played, click on Capture Gifs to capture the desired animated Gif. Click on it again to stop capture. That’s it! Your Gif is created. A message will appear on the top right corner of the screen confirming the Gif. You can see the preview of your Gif by clicking on the screen icon given on right side of the video screen. Below the screen icon, the output folder destination details will be displayed along with its size, where your Gif has been saved. The app saves all your animated GIFs in Pictures folder by default. You can also add caption to you animated GIF. As you click on the option Caption given below the video screen, Caption Properties will be displayed on the right side of the screen. You can choose your font style and size, make your caption bold or italic. You can also customize the background color and text color for writing the caption. The app also allows you to capture a smaller region of the video by moving the orange boxes given on the two extremes of the screen. Or you can also animate a specific region of the video by drawing a green box around it, using your mouse. Similar apps: Flip Boom Lite and Pocoyize. VidGiffy is a nice Windows 8 free animated GIF creator app that lets you create animated GIFs with captions easily. You can customise the settings for putting up caption on a GIF. More exciting is that the app also allows you to select a smaller region or a specific region of a video to create an animated GIF. You can also create your own GIFs and share them with friends via e-mail, using the Windows Share charm. Definitely worth trying an app!